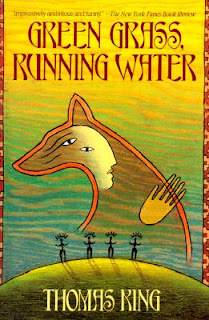 I first heard about Thomas King's Green Grass, Running Water on Eva's blog. I put it on my wish list and looked for it every time I went to a bookstore or a library, but never found it. And then I went to the BIG library and lo and behold it was there! And so I have finally read it, and I'm so, so glad I did because this book is really, really good. How can I describe it to you? There are four old men: The Lone Ranger, Robinson Crusoe, Hawkeye, and Ishmael. There is also Coyote. They have all escaped from a mental institution together. For the 37th time. One at a time, they tell Coyote a creation story. Coyote interrupts, and as each man tells his story, we cut across to other people's lives in the modern day- "strong, sassy women and hard-luck, heardheaded men, all searching for the middle ground between Native American tradition and the modern world." As the story progresses, all the characters move closer and closer towards the Sun Dance at their childhood home of Blossom, which is where (drum roll, please) the climax happens. I really didn't do the book any justice above, and so you will just have to trust me on its worthiness and add it to your wish list or TBR or Purchase Immediately pile based on your innate trust of my taste in books. Green Grass, Running Water is one of those books that really wows me with its structure. How do authors write books with parallel time lines that interrupt each other and weave in and out of each other and reference each other while also referencing the Bible, classic literature, and major events in American history? All while making you chuckle and smile and causing you to feel very sleepy at work because you stayed up way past your bedtime to finish the story. What I loved about this book is that there really were "strong, sassy women," as described on the back cover. And all the characters really were "searching for the middle ground between Native American tradition and the modern world." I loved that it wasn't the stereotypical fight against traditional parents that rears its head in so much cross-cultural literature. I also loved that no one in this story was drunk or abusive. Really, the people that populate this story are just... lost. And so it's just as much a coming-of-age novel as it is a Native American novel. And it's folk tales. And it's allegory. And it's comedy and feminism and history. And so much more, all wrapped up in one book. I'm still not describing this book as well as I wish I could. If you read five pages of it, you might be confused and a little leery because it's hard to get into the pacing right at the start. But if you read twenty pages of it, I dare you to not read 680 pages of it because everything will click, and you too will be wowed by King's dexterity in creating a story within a story that links to another story and references countless more. It's lyrical and beautiful and redemptive and melancholy, and I think you should go and check it out. Well then, I think I will! It does sound rather interesting, and since I do trust your taste in books, it seems like this is something that I need to read rather soon. I also sometimes wonder how an author can interweave plot elements, references and stories into one cohesive whole. Very nice review today, Aarti. I will be checking this one out! I know, it's so impressive and awesome! I hope you do check this one out, Heather - it's really, really good! This one sounds really interesting! I haven't read any of those classics that the characters are from though... would that affect my enjoyment of this book? Not at all! I haven't read any of those, either, and I enjoyed it. I think you described it wonderfully! I thought this an amazing book and it is so cool to see it on the blogs today! WOOT! I heartily recommend it, too. Well, with you, me, and Eva recommending it, WHO WOULD NOT READ IT? You read this without me?! ;-) I'm so glad you enjoyed this. Now I know that I will! I know! I was thinking about that when I started, but then I just couldn't put it down... let's put something on the schedule to read together, though! Would you still be interested in Bury My Heart at Wounded Knee, or no go? You've convinced me Aarti and I think some of the best books are those that you have to have a bit of patience with at the beginning. That's true - you just have to trust the author to take you where he wants you to go. So glad I put this book on my wish list way back when you reviewed it! Got any other fun Native American authors (other than Sherman Alexie) you recommend? YAY!! I am so glad! I don't think you'll be disappointed. Can't wait to hear what you think! Aw, thanks :-) Glad I was effective! Another great review. And another book added to my FIND NOW list. Fits with what I have been reading about Indigenous Australians. Thanks. Yes, it would parallel that nicely, I think. Looking forward to hearing your thoughts! I read this for a First Nations literature class I took some years ago and also enjoyed it a lot. I wish I had blogged about it, though because as usual with books I don't review I'm a lot less clear on the details than I'd be otherwise. One to revisit one of these days! Oh, what a fantastic sounding class! Putting it on my to-read list. It's sounds like the author does a fabulous job weaving everything together. Hahaha, dammit, Aarti! This has been on my TBR list forever, and I've never been able to find it at any of the libraries I've had access to. I've spent several years trying to talk myself into believing that it just isn't a very good book after all, and now I can't keep up the pretense. Blast. It's for the best, Jenny, I assure you! You will heart him. The other works of his that I've read are also very good, although the mythic elements in this one really do bring the whole thing home in such a powerful way that it still stands out as brilliant, making the others seem quite fine but not GGRW. You've made me want to re-read right now!